We are social beings … [T]his fact is a central aspect of learning. Knowledge is a matter of competence with respect to valued enterprises—such as singing in tune, discovering scientific facts, fixing machines, writing poetry, being convivial, growing up as a boy or girl, and so forth. Knowing is a matter of participating in the pursuit of such enterprises, that is, of active engagement in the world. We all belong to communities of practice. At home, at work. At school, in our hobbies—we belong to several communities of practice at any given time. And the communities of practice to which we belong change over the course of our lives … [C]ommunities of practice are everywhere. Families struggle to establish an habitable way of life. They develop theory own practices, routines, rituals, artifacts, symbols, conventions, stories, and histories. Family members hate each other … love each other … agree and … disagree. They do what it takes to keep going. Surviving together is an important enterprise, whether surviving consists in the search of food … shelter, or in the quest for a viable identity. Workers organize their lives with their immediate colleagues and customers to get their job done … they develop or preserve a sense of themselves they can live with, have some fun, and fulfil the requirements of their employers and clients. No matter what their official job description may be, they create a practice to do what needs to be done. Although workers may be contractually employed by a large institution, in day-to-day practice they work with—and in a sense, for a much smaller set of people and communities. Communities of practice should not be reduced to purely instrumental purposes. They are about knowing, but also about being together, living meaningfully, developing a satisfying identity, and altogether being human. [It] is by its very practice—not by other criteria—that a community establishes what is to be a competent participant, an outsider, or somewhere in between. 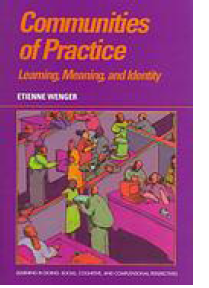 In this regard, a community of practice acts a logically negotiated regime of competence. Within such a regime, knowing is no longer undefined. It would be defined as what would be recognized as competent participation in the practice … A community’s regime of competence is not static. Even knowing something entirely new, and therefore even discovering, can be acts of competent participation in a practice.